Posted on November 9, 2011 by Monsieur K.
Distraught. Reaching for things in the dark. Grasping something. Feeling it in my hands. Naming it. Possessing it only for word’s sake. 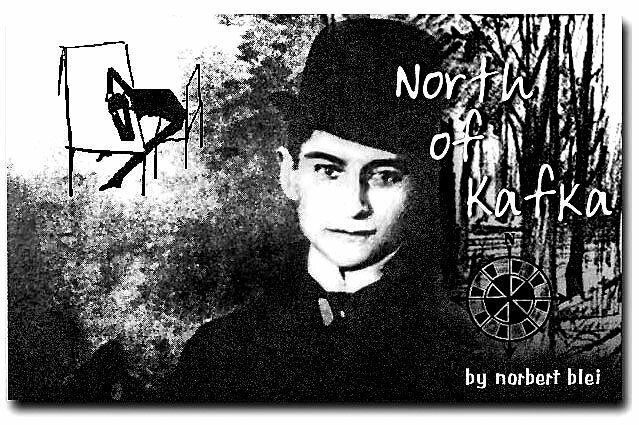 This is not the next “North of Kafka” he intended to write, he tells himself. He is still working on that. Two more unfinished works to add to his oeuvre of incomplete, inconsequential, lost symphonies of the moment. Again life takes over, interrupting him, rearing its mysterious head, leading him to the abyss. He is angry with himself. Angry with all that led him there. Again. 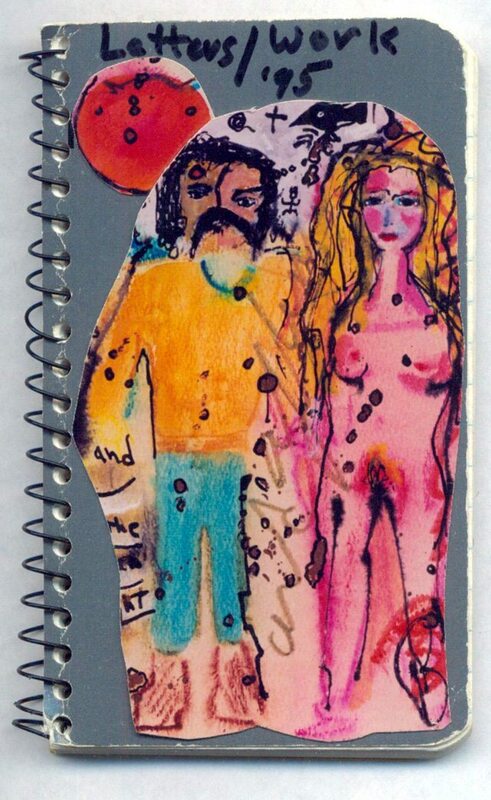 He is looking for himself in an old notebook (one of the two unfinished Kafka symphonies in progress: old notebooks), but this is not the one, “Letters/Work,’95”, mostly listings of correspondence. Though the cover is a revelation of better days. Painting made him pure, whole. In love again. He pages through the names of correspondents in “95,” only to discover how many have left, gone over, into the abyss…that grey field of the cover painting, returning him there, where he began. Loss. the day’s already over and evening is falling to erase. This entry was tagged Franz Kafka, Norbert Blei, North of Kafka. Bookmark the permalink. Norb, a good six or seven lines is the real thing. Everyday? A life’s work. Not troubling at all. Now is the hour of content. It was a beautiful sense of anticipation from the North then, and still now. Watercolor and torn paper. Norb, sometimes the years spin by so fast that I have vertigo just trying to figure out who I am anymore. All the “somedays’ have passed and I still have a lifetime of bucket lists leading me forward but I’ve slowed up and they have grown wings on their heels. I totally loved it. It reached into the depths of me and created a feeling that I can’t describe. You are writing what I need to read. A beautiful reminscent of the question whether life inside oneself leaves any trail? If a frozen lake, the axe will not do. I think you know, however, the answer. It pertains to the question, how to respond to silence, the silence inside of you? More often than not it has been created by those who did not respond to your call for love of life. There is a saying by a good friend who works at the European Commission on the program ‘life long learning’. She tries to convert it into ‘life long love’. We ascertain a bit of happiness when we do not give up that special love while still trying to find the key for all those closed doors by silence. Winter comes. With snow on the ground there is a new silence to be discovered. Or when watching children growing up, parents watch often in silence, astonished about the fact that they have done not nothing, but something, to bring this life on earth. All this continues when seen from atop of the hill and mapping the landscape around with eyes remembering when love came suddenly swift like the birds of spring to surprise you. A beautiful piece this ‘North of Kafka’, especially since a second time around. Yesterday, my friend became a grandmother, at age 70, at last. She told me that the fingerprints of each of us are formed in the womb by the time we are just 3 months in the development stage. I look at your watercolor. There at the end of your arm, where the hand begins, the word AND, the clue. I sense a rumble of “tektonicos”, shifting the “what is 2 what is not”…shall we expect some subtle work on the wrinkle of time, or a major exorcism that will blow the Coop down, hatching an Alyce that has had her fill of the caterpillar and his intoxicating brew?